Remember last month when I posted that incredible super-hi-res image of the Moon’s near side? A lot of folks asked if an image of the far side were coming soon. Holy Selene! Click to enlunanate. 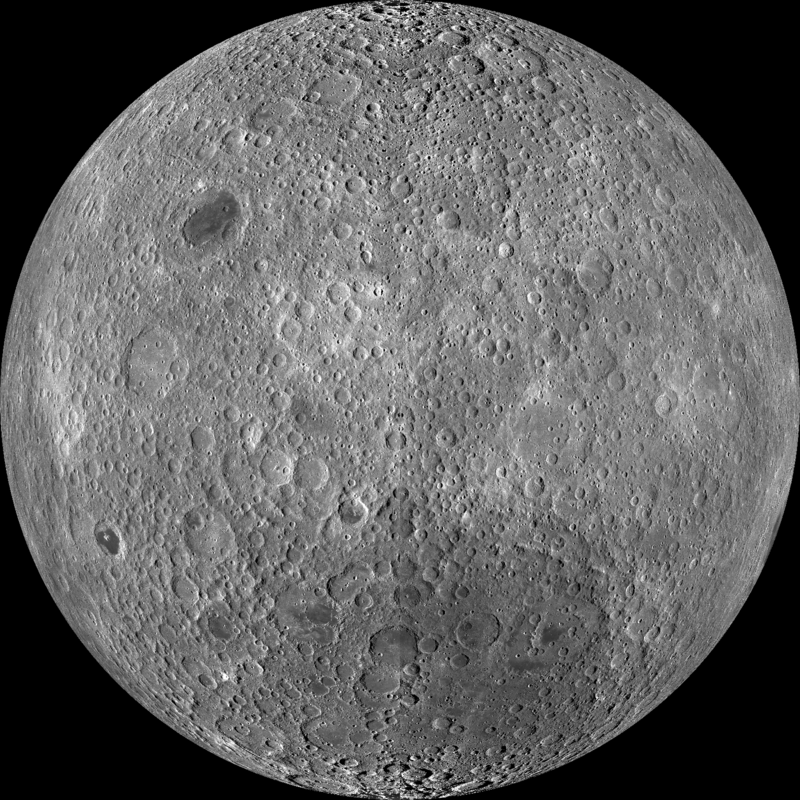 This amazing mosaic is from the Lunar Reconnaissance Orbiter, circling the Moon from a height of a mere 50 km (30 miles) and mapping that entire world. This image is comprised of a whopping 15,000 images from the Wide Angle Camera — yegads! — and shows the side of the Moon we can never see from home. It looks really different than the near side, doesn’t it? It’s almost entirely craters, while the side we see is dominated by huge lava filled basins called maria (Latin for "seas"). Why is that? Well, it’s known that the crust on the near side is thinner, so it’s easier for big impacts to have punched holes in the crust and allowed magma to bubble up (this was billions of years ago when the inner Moon was still molten). But why does one side have a thick crust and the other thin? No one knows. Interestingly, it’s probably tides from the Earth that forced the Moon to have this asymmetry line up with us. The Moon causes tides in the Earth, but the Earth does the same for the Moon, and the tides we create on it are much more powerful, since the Earth is far more massive than the Moon. Tides like to stretch things, and they also like to have any imbalance settle along the Earth-Moon line. You might think the heavier side would settle toward the Earth, since that’s "down", but in fact tides don’t care if the heavier side is pointed directly toward the Earth or directly away, as long as it’s on the Earth-Moon line. In our case, the heavier side of the Moon points away from us. Weird. But while the Universe has to follow the laws of physics, it doesn’t always have to follow our common sense. 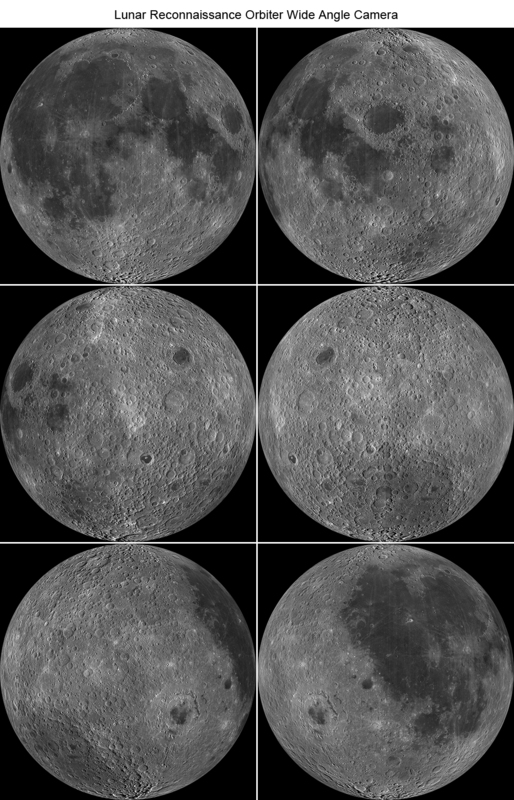 You can explore the Moon yourself; the folks at LRO also released this very cool picture of the Moon as seen from all sides, in 60° increments. Scanning over this is fascinating. I’m used to looking at close-ups, so seeing the overall picture is very, very cool. And useful. Maps like these will be used to gauge where to send more probes, and, eventually, people. I can’t help but wonder: in a few decades, will school children have to memorize the locations of Mare Orientale, Copernicus, and Rupes Recta… before taking a field trip there? – There’s a hole in the Moon!